Practically every major source of power generation in the world involves the production of heat, which eventually becomes the electricity that we use. Nuclear, coal, natural gas – the direct end result of all of these processes is heat, which is usually then transferred to water. This water is then turned into steam, which drives the turbines that give us our electrical end product. It’s undeniable that making things hotter is one of our most ancient and reliable methods of getting things done – from cooking food to making cars run, the energy often associated with or directly resulting from an increase in temperature is an old and true friend. As it turns out, so is generating power from one of the biggest sources of heat around – around, not out in space... yes, our own planet. The Earth, much like an onion, is layered – chemically, though, rather than physically. The temperature of the inner core has been estimated at values of nearly 7,000 degrees Celsius, or 12,000 degrees Fahrenheit. Geothermal power is an alternative energy source, and as such claims less than 1% of the world’s energy supply. Understandably, while estimates of globally exploitable geothermal reserves vary, they tend to be fairly encouraging. Total worldwide production of electricity in 2005 was 65 exajoules (EJ); that’s a 65 with 18 zeroes next to it. On the other hand, according to a 2006 report on geothermal power by MIT, the world’s total reserves were calculated to be over 13,000 zettajoules (ZJ) – that’s a 13 with a whopping 24 zeroes! Of this, at least 200 ZJ were estimated to be exploitable, with the potential for a further 1,800 ZJ to be extracted through technological advancements. Other groups, such as the International Energy Agency (IEA), have figured the numbers differently but come to the same conclusion – there's enough geothermal energy for thousands of years. Current geothermal production is only 0.2 EJ, so there’s clearly plenty of room for geothermal power to grow as an alternative energy source. Geothermal certainly holds its own with the best of them at about 6.5 cents per kilowatt-hour. Coal and nuclear power are still powering the way ahead with their 4-5 cent/kWh generation costs, but geothermal has already proven itself to be a viable alternative, not just on the environmental front but also the economic one. So, how does the forecast for geothermal energy look? With 75 new geothermal power projects over twelve states underway in 2007 in the United States alone, the answer is: pretty good. Geothermal plants are, perhaps fortunately, nothing special. They don’t require any particular manufacturing concerns or exceptionally location-specific design considerations, much like, say, a coal-fired plant. So it's little surprise that most geothermal companies are already as “vertically integrated” as one can get, offering complete geothermal plant solutions or even getting contracts to drill their own wells and build over them, as a private utility. That’s more or less the extent of the differences between companies. On one hand, you have the problem solvers, the retailers, the companies that sell and operate geothermal systems as their primary business. On the other hand, you’ve got the utilities, the companies that stake geothermal deposits, get licensed, build plants, and sell their electricity. That’s all there is to the geothermal industry – very simple, no frills attached. Juniors account for a very large portion of the geothermal pie. Geothermal juniors are all junior utilities, companies with tenements on hydrothermal reservoirs looking to get licensed or raise enough money to build their first geothermal plant. So out of these three constituents, which one should we be betting our money on? Well, the answer should be fairly obvious; much like with, say, uranium, our best hope of profiting from the market lies with the juniors, the ones looking to develop into full-fledged utilities that sell electricity. So let’s take a look at how the geothermal market shapes up. 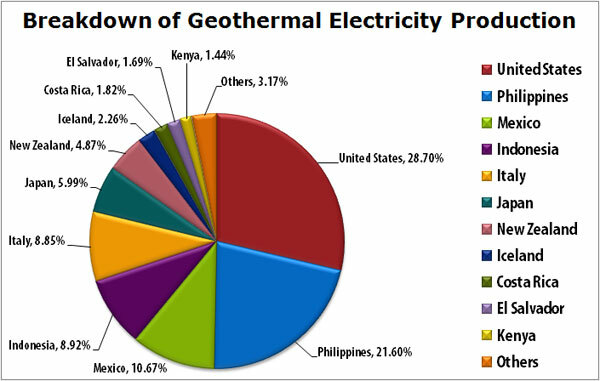 The United States is currently the largest producer of geothermal energy in the world. 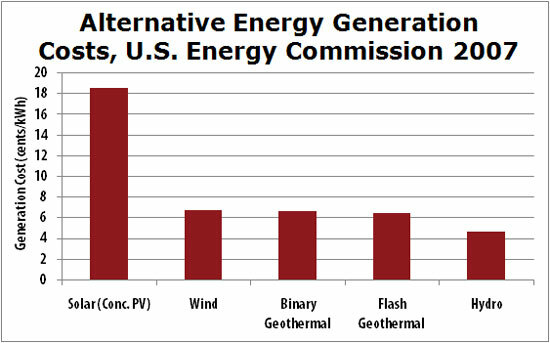 Nonetheless, geothermal still accounted for less than 1% of U.S. energy production last year. Perhaps surprisingly, the Philippines come in second place, with Mexico holding up third. Geothermal holds a lot of potential in the United States, China, Hungary, Mexico, Iceland, Australia and New Zealand, but that doesn’t necessarily mean said potential is being exploited. More so than many of its fellow alternatives, geothermal has kept fairly low-key in the last few years, garnering very little interest despite being a clean and renewable source of energy. As a matter of fact, between the U.S. and Canadian exchanges, there are only ten geothermal companies. Even if you include the Australian exchange, which sees a lot of geothermal action thanks to its abundance of HFR-type deposits, the count only gets brought up to 23 companies. As we’ve previously seen, most of the companies in the geothermal sector are juniors, a statistic that is reflected in these market cap charts. Many have nothing more than a couple of stakes in the ground as far as development is concerned, but that’s where every junior starts out in this industry. In any case, the geothermal market is certainly a small one, but even in a small sector there are bound to be winners. And with the increasing demand for clean, green energy, it’s only a matter of time before more people pick up on the fact that geothermal is not a strange and rare form of alternative energy, but rather a source of power just as viable as its cousins hydro or wind – perhaps more so, because geothermal plants tend to stay off the radar screens of nature lovers grumping about their spoiled views or ecosystems. Low-key works both ways. What do we anticipate for geothermal in the future? Will there be a surge in popularity, a sudden eureka as people and governments alike flock to geothermal as the next savior in this current energy crisis? Probably not. Geothermal has always been one of those technologies with very low public awareness, and we see nothing to indicate how that might change anytime soon. So, barring some kind of strange series of coincidences, a geothermal bull is not in the cards for now. Still, does that mean that geothermal is a dead-end market? By no means – as previously mentioned, there were 75 geothermal projects being developed last year in the United States alone. With less than 75 plants currently operating in five states, that’s a significant number. Just because there’s no public awareness doesn’t mean it’s not happening. In fact, it's the plain-Jane doggedness of geothermal that we're counting on: despite lack of knowledge about it, despite the extremely small value of the market as a whole, geothermal still happens. And it will keep on happening because it hits on the three hot buttons of today's energy market: it's tested, economically viable, and environmentally acceptable. Aside from money, energy makes the world go around... it’s a commodity we can’t do without. Therefore, top-quality energy stocks and ETFs are assets that will only increase in value over time, as emerging markets raise their energy demand and Peak Oil looms on the horizon. With the right timing, energy stocks can provide huge gains: in 1998, Doug Casey advised to buy uranium stocks – at a time when no one wanted to hear about uranium. Within a few years, Doug’s subscribers were looking at returns of 660% on Strathmore… 895% on Cameco… and 1,333% on Paladin Resources. Right now, many energy stocks are extremely undervalued. Click here to learn more about how to seize this opportunity and prosper.